There was no space for this one: Queen Emma's Diamond Tiara, worn frequently by Queen Beatrix and occasionally by Princess Laurentien. Maxima wore it during the state visit in Qatar in March 2011. The oldest tiara in the Royal Families collection, the Laurel Wreath Tiara, dates back to the 1800s. Some believe it belonged to Princess Louise, a sister of King Willem I, while others say it was purchased by Queen Juliana in 1956 for Princess Beatrix's 18th birthday. 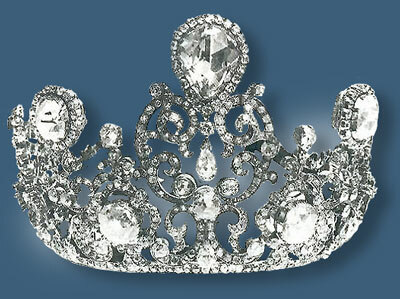 The tiara is made entirely of diamonds and resembles a Grecian headpiece. Beatrix wore the tiara frequently when she was young. Her sister Princess Margriet wore it on many occasion. The last person who has been seen wearing this tiara was Princess Laurentien. Queen Sophie, born princess of Württemberg, received the diamond and pearl tiara as a wedding present from her father, König Wilhelm I von Württemberg. Queen Beatrix chose this striking tiara, in it's most elaborate setting, at her 1966 wedding to Claus Von Amsberg. 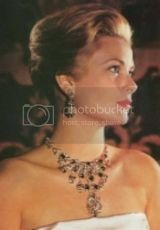 In the 1970's she has worn the tiara with only the lower row of drop pearls. Years later, in 1982, she would wear the most elaborate setting once more for a State Banquet in Great Britain . 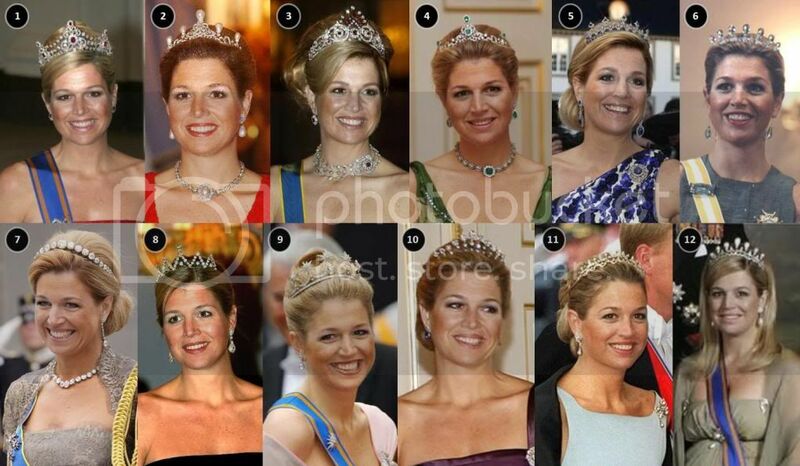 Since then she has worn the tiara in a more simple setting. I love the Bracelet of the Colonies In 1937 Princess Juliana received a huge platinum and diamond bracelet from the peoples of the Dutch East Indies. This historical bracelet has been broken up in the 1990's to make two smaller diamond bracelets. Queen Beatrix has never worn any part of this parure, possibly because it's too ostentatious for her taste. Beatrix has a lot of migraine attacks, according to her son in an interview they gave in the 80-ties (the bigger the headache, the bigger the smile he commented), so I assume these diamonds are to heavy. Given her distaste for necklaces (and heavy jewelry in general), making it a necklace wan't an option either. Like with the other jewels which are collecting dust in the vaults, for this set we have to put our hopes on Maxima as well (though she can never wear it while Beatrix is still reigning), and assume the piece isn't sold. In recent years rumors have surfaced that the tiara has been altered to make it more wearable. 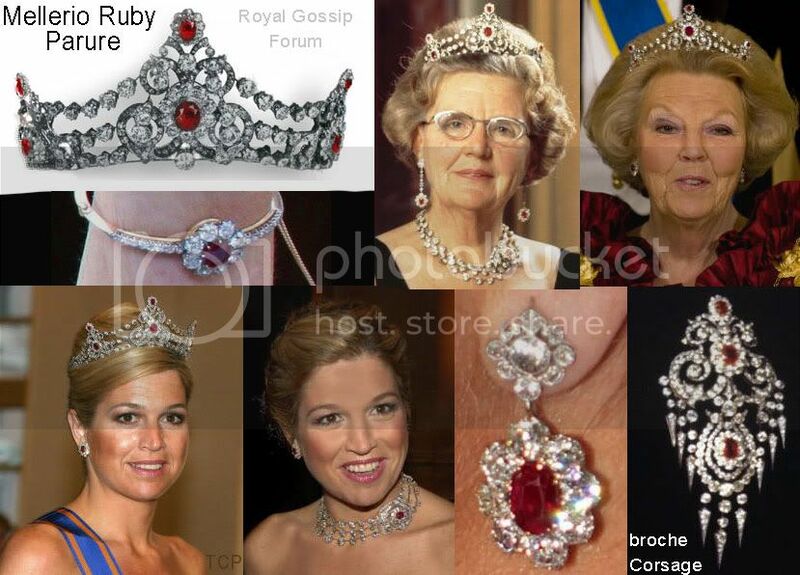 Here is more about it: http://www.royaldutchjewels.nl/Mellerio_Ruby_Parure.htm I like this one more than the oriental circlet of Queen Elizabeth. Apparently there are no crown-jewels that belong to the crown as an institution. Maxima wearing the aquamarine set! As a wedding gift did Queen Juliana receive a necklace that had belonged to Queen Emma?